"You guys better get out of town fast," Faridoon, a 21-year-old Afghan says as quietly as possible to the two Newsweek reporters who just walked into his shop, just outside of Kabul. "There's Taliban everywhere." Clearly, the Afghan does not want to been seen doing business with the Americans. He's afraid of the Taliban laying a siege around Kabul by taking over the belt of towns and villages surrounding the capital. "Kabul's early morning silence was broken last night first by the crunch of rockets exploding in the city, then by the emergency sirens at Nato headquarters warning the officers and generals to head for the shelters," says a BBC report following the killing of ten French soldiers by the Taliban insurgents yesterday. After Kandahar and Peshawar, Kabul is the third major city to be targeted by the resurgent Taliban. Recently, the Taliban have staged daring raids in Kandhahar and briefly taken over parts of the city and freed large numbers of prisoners. On June 16, the Associated Press reported that the Taliban assault on the outskirts of Kandahar is the latest display of prowess by the militants despite a record number of U.S. and NATO troops in the country. The push into the Arghandab district — a lush region filled with grape and pomegranate groves that the Soviet army could never conquer — comes three days after a Taliban attack on Kandahar's prison that freed 400 insurgent fighters. Those fighters, NATO conceded Monday, appear to be massing on the doorstep of the Taliban's former power base. The city of Kandahar lies only 10 miles to the southeast. In Peshawar, heavily armed bands of Taliban fighters have been intimidating people into observing their strict interpretation of Islamic law. In the last two months, they have suddenly tightened the noose on this city of three million people, one of Pakistan’s biggest, establishing bases in surrounding towns and, in daylight, abducting residents for large ransom. A New York Times report says they have turned up at courthouses in nearby towns, ordering judges to stay away. On Thursday, they stormed a women’s voting station on the city outskirts, and they are now regularly kidnapping people from the city’s bazaars and homes. There is pervasive fear that the city could fall to the Taleban at any moment. The provincial NWFP government in Peshawar, recently elected by a large majority, appears helpless against the Taliban. 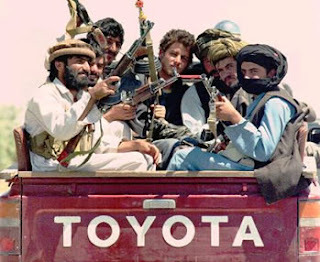 As the US-led NATO coalition in Afghanistan and the post-Musharraf government in Pakistan find themselves in policy disagreements and total disarray, with Hamid Karzai playing the spoiler, the resurgent Taliban appear to be preparing for the takeover of major cities on both sides of the border: Kabul and Kandahar in Afghanistan and Peshawar in Pakistan. This is something that would have been considered unthinkable just a few months ago. The concern until recently was focused on the tribal areas of Pakistan. Now the Taliban are asserting themselves in the settled areas, such as Swat and Peshawar, long controlled by the Pakistani government and attempting to enforce their tribal code of morality and cultural norms. The Taliban have clearly taken advantage of the sincere efforts of the new Pakistani government to bring peace in the region. They have used the lack of pressure, and windfall narco-profits from Afghanistan, to regroup and rearm themselves to push their broader agenda of seizing control of Islamabad and Kabul. The actions of NATO and Pakistani military in response to the Taleban's latest offensive appear to be too little, too late. An effective response to this seriously deteriorating situation requires a joint NATO-Pakistani strategy backed by strong coordinated action to strike a powerful blow against the Taliban on both sides of the border. This powerful action must then be followed by sustained pressure on both sides of the border to prevent Talebanization of the entire region with all its disastrous consequences for the people in Pakistan and Afghanistan and wider implications for the rest of the world.